Ready or not, pumpkin-everything season is officially upon us. And while summer is sadly washed away by a wave of piping hot pumpkin spice lattes, it looks like Dairy Queen may have made a slightly smoother transition into pumpkin insanity by serving fall flavors in a vehicle that's cool enough for the warm September weather: soft-serve ice cream. Dairy Queen recently announced the return of its two fall Blizzard flavors, Pumpkin Pie and Apple Pie, which both sound pretty basic, but considerably less basic than plain old pumpkin spice. The pie-filled Blizzards already started rolling out to DQ locations nationwide last week and will stick around through October, or around the time when you no longer have to justify eating pumpkin-flavored everything. Both of the flavors are built around the classic combination of ice cream and pie. The Pumpkin Pie Blizzard is made with small pieces of pumpkin pie and soft-serve ice cream that comes topped with whipped cream and nutmeg. 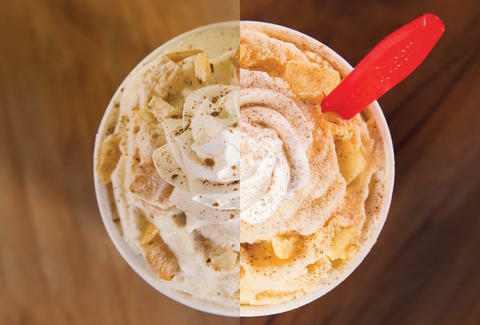 The Apple Pie Blizzard is a blend of apple pie filling, cinnamon pie pieces, and vanilla soft-serve that’s topped with whipped cream and cinnamon, according to a press release. In other words, they're the logical dessert after downing a pumpkin spice latte, right? Of course, you can just accept that it's still above 80 degrees outside and order a regular ice cream cone instead. Tony Merevick is Cities News Editor at Thrillist and realizes it's still early September, but can really go for some pumpkin pie right about now. Send news tips to news@thrillist.com and follow him on Twitter @tonymerevick.